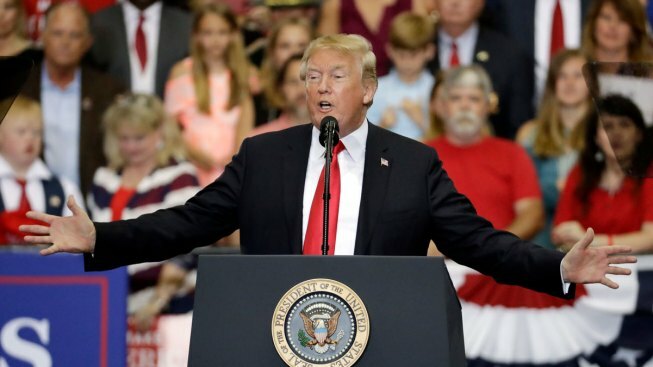 President Donald Trump speaks at a rally Tuesday, May 29, 2018, in Nashville, Tenn.
President Donald Trump slammed frequent foe Sen. John McCain, R-Ariz., who is battling brain cancer, for having voted against one of the measures that would have repealed Obamacare last year, NBC News reported. Speaking at a rally on Nashville, Tenn., and referring to McCain without using his name, Trump said his efforts to scrap President Barack Obama's signature health care law were frustrated by the Arizona senator's decision to give a thumbs-down to the bill on the Senate floor in July. "We had it done folks, it was done, and then early in the morning somebody turned their hand in the wrong direction," Trump said. "The person that voted that way only talked repeal and replace. He campaigned on it."